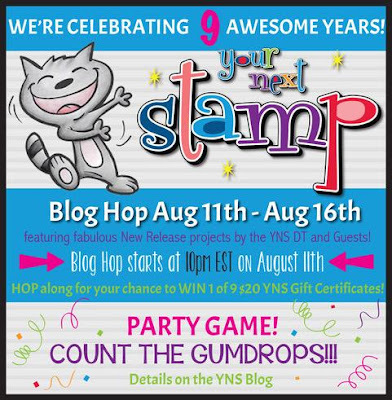 Hello everyone and welcome to the Your Next Stamp (YNS) August release blog hop! So glad to be guesting this year again! A big thank you to Karen for having me in the line up! 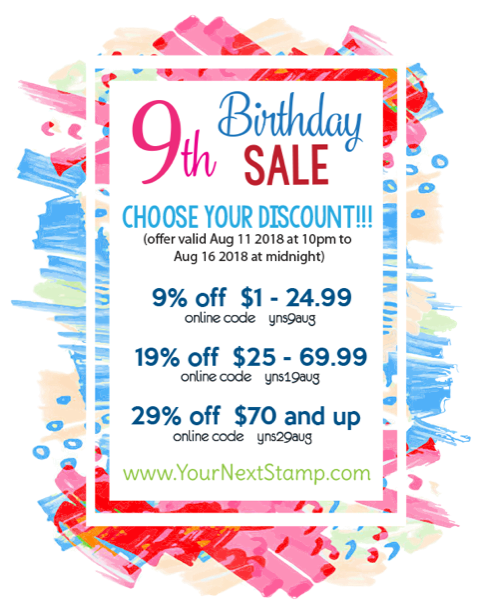 Your Next Stamp is turning 9 and there is a special sale to celebrate their birthday! YAY! Make sure you hop around to all of the blogs featured in the link list at the bottom of this post. You will find lots of inspiration using the new products! I made a top folded card base and used Distress inks and blending tools to create a fun background. I stamped the mouse with the stacked cupcakes in black ink, colored the image and cut it out with scissors. The sentiment is from the Cupcake Day set too. To finish off my card, I added enamel dots. It gives a colorful and happy touch to each project. NINE (yes 9!!!) random winners will receive a $20 gift certificate to spend in the YNS Store. How to join in? The more blogs you visit and comment on, the greater the odds of winning (but you don’t have to comment on every blog to be qualified to win). The blog hop starts now and ends on August 16th midnight EST. The winners will be announced on the YNS blog on August 18th. More birthday fun and another chance to win a prize! Join the YNS Party Game. Count the gumdrops on the creations along the hop and leave your count on the Inlinkz (on the YNS Blog hop post) for a chance to win a gumdrop prize pack! Now it's time for you to head over to the next stop but don’t forget to leave a comment before you go for your chance to WIN! I will share another spot using new stuff from the fabulous August release later this month! Thanks for stopping by and see you soon! I love your background! The Cupcake Day set is adorable. Your coloring is beautiful. Francine, your card is wondrful! Colorful and FUN! So glad to have you joining us for the release. What a FUN card! Love the background! What an adorable card and stamp set! Great background. Adorable card! I love your stenciled background and your coloring. oh my CUTE! I just love your coloring, such a sweet project! Beautiful and adorable card ! Your coloring is incredible. This stamps set is already on my wish list.... LOL ! is a really sweet stamp set. Awww!!! It's super super cute!!! Love it!!! Adorable card! Thanks for the inspiration! I love these little mice! Great card! All your cupcakes look yummy! Such a sweet birthday card! Cute card. Love the stack of cupcakes. What a sweet card. Love the new cupcake stamp. I love the gorgeous and bright way you have colored these happy cupcakes! It all looks so yummy and fun! Your background is amazing! And I love how you colored the little mouse! Adorable card! Beautifully colored and amazing background. Cuuute card! Love the background. Love the inked background! Your coloring is so awesome! LOVE all of your products. Beautiful. Congrats on your guest spot at YNS. Cute cute cards. Gumdrops cleaver. The new stamp set is so adorable I love it! You did such a wonderful coloring of the main focus and background. Thanks for a chance to win. I love the gumdrops! so cute with the cupcakes and love the background. Hi Francine! I love your card. The lite mice are so adorable. What a cute card ..sweet image. This new release looks fun and whimsical! Love the card you made! WOW! Your background is so cool and I LOVE your coloring.... Fantastic!! Ohhh I LOVE that sweet little mouse with his yummy cupcakes! The cupcake set is my favorite so far, and I think your background is just perfect to show it off! TFS! What a great birthday card sample. Adorable!!! Love your background and the fun sentiment paired with this cute image! I adore the backgroud. It is so different and colorful! Your card is just adorable. Can't wait to see the rest of the release. That is my favorite set, and your coloring is spectacular!! What a fun card! Your card is adorable and so wonderfully colored. I love this set. Super fun card love it! Darling card, such an adorable image and your coloring is fabulous! Such a cute card. So far, you are the first one on the hop for me....and I am so excited to see what all of you talented artists are sharing. What a whimsical mouse-y for such an occasion. Cupcake Day is super adorable! I love your card design! I LOVE how colorful and fun this birthday card is! 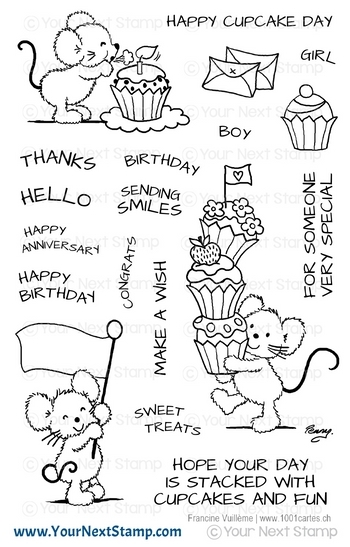 Adorable mouse stamp set!! These cute critters are so lovely on this fun card. I love your card, adorable. Love the color combos, this is so fun! Oh my gosh, this is beyond adorable! Love how you popped the images up off of that fun stenciled background! I l❤️ve this stamp. I nicknamed my youngest son "Cupcake" because he was so sweet. He's still sweet but he's now 45 and 6'5" and I STILL call him "Cupcake". You did beautiful coloring! Super cute birthday card! 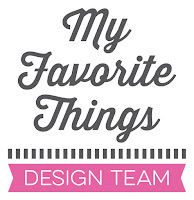 I love your stenciled background and your beautiful coloring of the images, Francine! I also love how you fussy cut and popped everything up with that sweet sentiment, too! Sure is cute, love the coloring, pretty yummy! How adorable is your card !! These little mice are tooooo cute !! Absolutely adorable! What a super sweet card! I absolutely love your card!! Your coloring is excellent!! I will be glad when I can get 10% that good! Lol!! This is one of my favorite sets!! I am a cupcake fanatic!! Yum! Terrific card! 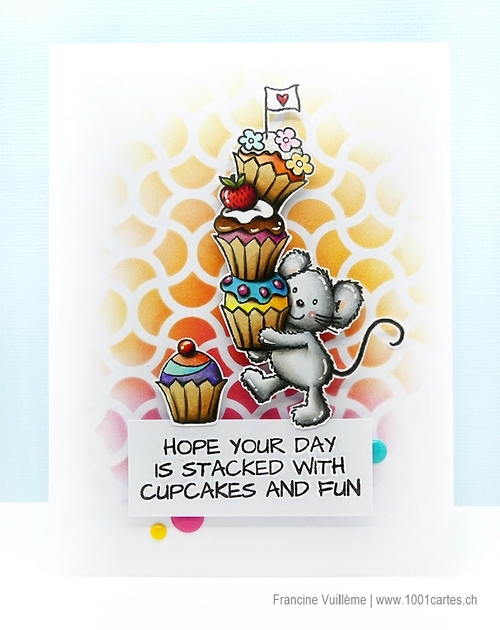 Love the subtle fun fading background you created, the adorable mouse with its stack of cupcakes an a great sentiment! SO fun! Wonderful card. Love the cute image and your fantastic background. These little critters are so adorable. I love the cupcake stack. Cute card. Sweet card. I love your coloring!